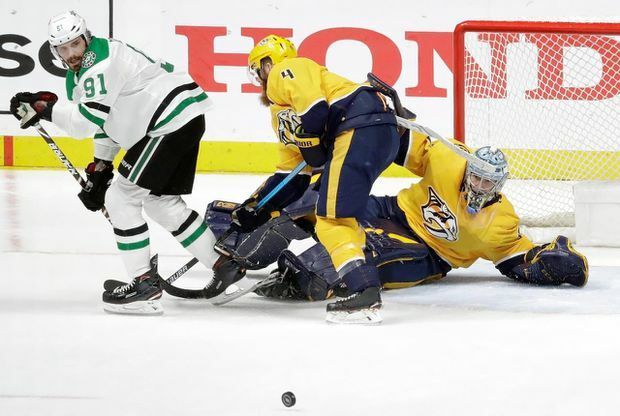 The teams fought to the first scoreless period of this young series to open this game, though the Predators killed a four-minute penalty on a double minor to Mattias Ekholm and out-shot Dallas 15-9. NOTES: The Predators improved to 5-2 at home in Game 2 all-time with their first home playoff win since Game 2 of their second-round series last spring against Winnipeg. Nashville now is 8-11 all-time in Game 2 overall. Grimaldi played his first post-season game since April 2016 with Florida. Benn now has at least a point in 10 of his 11 career post-season games on the road with four goals and nine assists.